At seventy, Eddie Linden is a skelf of a man, but a skelf with attitude. Electric attitude. He discovered his precarious but potent and potentiating identity as a gatherer of literature. A poet himself, his charisma has exerted a pull on fellow writers, including Seamus Heaney, Robert Creeley, Tom Leonard and Elaine Feinstein through eighteen issues of Aquarius, the magazine he conceived and founded over thirty-five years ago. Conceiving magazines is something that many determined spirits fall prone to. Most of these publications fail to survive an intense gestation period falsely presaging a lusty incarnation, and are swiftly flushed from memory. A few with a braw set of lungs breenge into the new morning created with their arrival and plant themselves in the imaginations of readers and contributors alike. All face the same set of survival challenges. Collecting material of the desired quality is a challenge Eddie Linden always rose to and, like Duncan McLean, founder of the Clocktower Press, and legendary independent publisher John Calder, he excelled at doorstepping – an unavoidable aspect of distribution for small presses. All the seats at the event in the Scottish Poetry Library were rumbustiously occupied by notable Scottish thinkers, intellectual and artistic free spirits, many of Eddie’s own generation. Splendidly vocal throughout the proceedings, they were a collective testament to the warm regard they felt for the man. Sebastian Barker’s fictional biography was called Who Is Eddie Linden? Everyone here knew. 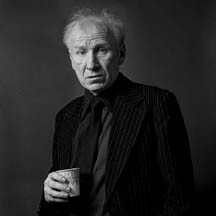 The photographic portrait of Eddie Linden which accompanies this article is one of a series by Granville Davies. They capture his force of personality, a kind of stylish grumpiness, the mouth refusing a smile, the eyes interrogative and assessing. The pin-stripe suit is worn with cool – he could be David Bowie’s big brother. 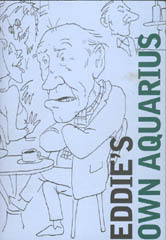 The cover of Eddie’s Own Aquarius carries a Gerry Mangan cartoon showing him in Paris hunched over a coffee, arms folded tightly high on his chest, bottom lip jutting; he’s thinking, ‘Ah hope ahm not missin any good funerals…’ His congenital pessimism is no doubt rooted in a hellish childhood which cannot be consigned to forgetfulness, the harrowing details of which he has frequently recounted. He recalls the Dominican priest Father Anthony Ross as his saviour, showing him kindness when he was almost broken, seeing the potential in the unlettered teenager and giving him the run of his library. Perhaps this altruism laid the foundation of Eddie’s own generosity as an editor. But when he bursts into him poem ‘City of Razors’, the pain is as raw as the energy of the declamation. 2 Comments on "Aquarius Fellow"
Is there still a possibility of getting a copy of Aquarius 25/26? Thanks for your reply.